We are involved in providing a qualitative array of Spherical Roller Thrust Bearings to our prestigious clients. The offered thrust bearings are designed using superior quality raw material and advanced technology in adherence with industry norms. The thrust bearings provided by us are rigorously tested under the supervision of our quality examiners against different parameters. 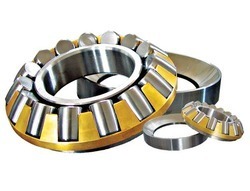 Moreover, these thrust bearings can be availed in the market at industry leading prices.